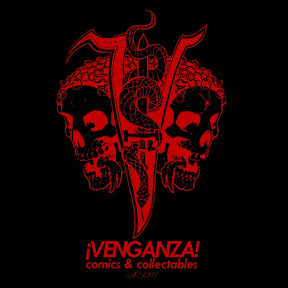 Perth's only comic book and collectables store, Venganza, will have its grand opening on Saturday 10th September and with loads of special offers on throughout the weekend and loads of freebies and prizes, owner Brendan Dalton promises it's going be a great weekend. Promoting British independent publications as well as Marvel and DC, Brendan tells us he has 10 signed and numbered copies of Becky Cloonan's self published Wolves on offer, along with a few copies of the first issues of UK self-published comic anthology Solipsistic Pop. 10 limited edition shirts will be given away at random for purchasing customers throughout the day, and there will be offers on many items, including graphic novels. Rummaging through my loft I came across this page of art from Marvel UK's 1993 Doctor Who Year Book by Lee Sullivan - a strip I edited while editor of Doctor Who Magazine. It really needs a better home than my loft - for a start, someone will need to lovingly put some of the word balloons back into place - so if it's a piece you'd like for your wall, head over to eBay and make a bid. The strip is 'Metamorphosis', written by Paul Cornell. Although it appeared in colour in the Year Book the art is black and white and features Seventh Doctor companion battling Daleks hand to sucker as only she can. The Review: First created by acclaimed artist Hoshino Yukinobu, one of Japan’s leading manga artists, in 1990, Professor Munakata Tadakusu is one of Japan’s most famous manga characters, with millions of readers eagerly following his adventures in the fortnightly magazine, Big Comic. A historical ethnographer, Professor Munakata has dedicated his life to unravelling the mysteries of Japan’s past, with previous adventures seeing him uncover ancient burial grounds and lead dangerous archaeological excavations. 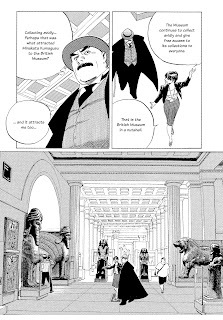 Following his first visit to the British Museum in 2009, Hoshino Yukinobu was inspired by the unique setting that the museum could offer for a Professor Munakata mystery, and quickly began work on Professor Munakata’s British Museum Adventure. 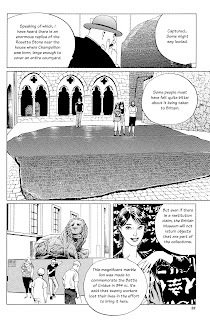 Japanese readers followed the story across ten episodes first published in Japan's Big Comic for five months before the thrilling mystery was bought to a close with a dramatic final scene that sees the Rosetta Stone in grave danger. 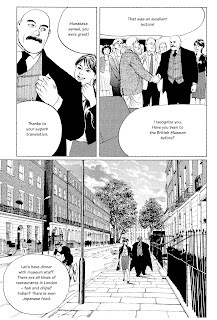 Professor Munakata’s Case Records have been serialised in Big Comic, Shogakukan, since 2004 and the art on this manga detective tale is absolutely incredible, as you can see from the selection of samples published here. Hoshino Yukinobu's attention to detail is meticulous, but his figure drawing, too, is beautifully drawn artwork. If you're not a regular manga reader it takes a while to get used to the story flow – the book follows the Japanese format of reverse pubilcation – but that's pretty easy to do. 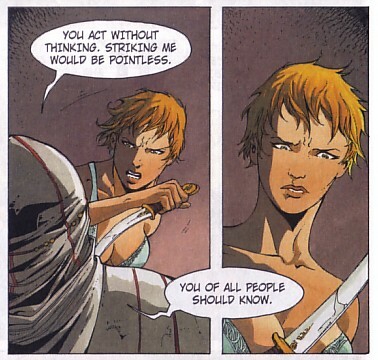 The adventure, an age-old conspiracy to bring shame to Britain for its past, rattles along at a reasonable pace (this is manga, after all, which enjoys a luxury of longform storytelling rarely afforded British or American comics), enabling plenty of character development and throughout, quite gorgeous art. Plot-wise, the adventure holds together well – I don't want to say too much about it because it would spoil some of the twists and turns. 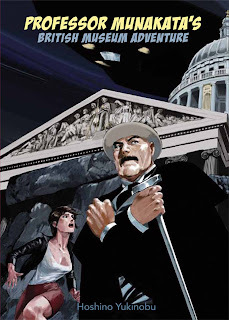 However, I can reveal that the story tries to address the thorny issue of the repatriation of British Museum treasures – and Munakata proves a wily and thoughtful adversary to his enemies. For all the wonderful art (in a new story last year, The Economist noted in a spoiler-filled report that normally manga appears in a series of nine episodes but Mr Hoshino was so enamoured with the adventures at the museum that he broke the rules and drew ten), I have to say that I found the dialogue often fairly stilted, perhaps on occasion a too literal translation of the original Japanese text rather than a more considered English adaptation. However, I'm conscious that such liberties with the script may well have been contractually denied this English edition – a problem that I find on occasion befalls some of Cinebook's titles. Despite this concern, I was simply blown away by Hoshino Yukinobu's art and I'd still recommend you track this title down on release in October. Given that tis is the British Museum Press's first comic title ever - and event in itself – it deserves support. 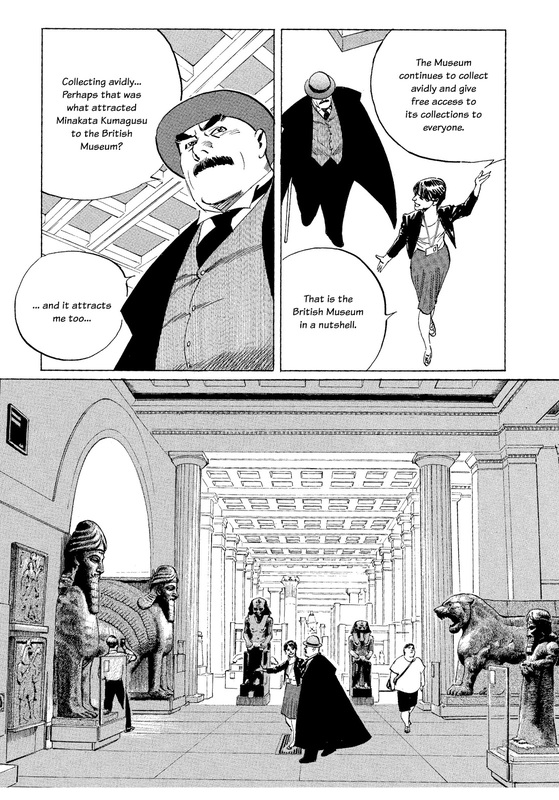 Professor Munakata's British Museum Adventure also features bonus supplementary material including an essay on the history of manga and an interview with the artist. Comic artist Al Davison (creator of critically-acclaimed The Spiral Cage and his new book, Hokusai: Demons) has dropped us a line about his campaign on the global funding platform Indiegogo to raise £4000 to print his new graphic novel, The Alchemist's Easel: A rough guide to drawing the unconscious. "One morning in 1988, I woke up to find I'd gone blind," the Coventry-based artist and author explains. "At the time, I had no idea that it was temporary. I just knew that along with the blindness I was losing my visual memory, the ability to visualize my family's faces, even simple shapes, and that the partial paralysis I'd had as a result of being born with Spina-Bifida had returned. "I was blind for three months on two occasions that year. My reaction to my visual memory fading was to continue to draw, even though I had no idea if the pen contained ink or whether the paper was blank or not. When my sight returned I began to analyze the drawings I'd produced, and what I'd leaned about tapping into the unconscious, perception, dreams, and drawing. I have been teaching art based on that knowledge for over twenty years. "Now seems like a good time to put all that on paper," he continues. "But a typical 'how to draw' book doesn't seem appropriate, given the subject. "Utilizing the techniques I have discovered to create the book is the only way to go. I've ended up with part autobiography part 'how to draw' and part dream showcase. I've taught everyone from school children to senior art students, from dream researchers to teenagers at risk and abuse survivors. I hope this book will allow me to continue reaching more and more people." Al and his partner Maggie, who also run Astral Gypsy, a graphic novel, manga shop and art studio in Coventry, are committed to the idea of the book as an art object in itself, as well as the book as a medium for reaching as many people as possible. "Our project combines both," says Al. "We want to produce a limited edition collectors item. 200 hardback copies with a quarter cloth spine, printed with vegetable based ink in an outsized format 31cm x 22cm printed by Calverts containing an original black and white drawing in each copy and priced at $49.00 All the proceeds of the limited edition will then used to print an affordable trade paperback edition." Al has turned to Indiegogo to try to raise the funds to print the limited edition graphic novel - but if they can't generate the $6,498 required but do get enough money to print a trade paperback they will do that, and contributors will receive a copy of that plus artwork to the value of their contribution. "If we fail to raise enough for even the trade edition, the money will go into a pot until we can explore other funding opportunities," says Al. "Contributors will receive artwork to the value of their contribution anything from a pencil sketch to a archival art print to a full color acrylic painting. "Should we reach our goal, and have money left over after printing the trade edition, that money will go towards equipment to help run art courses for young people in Coventry." 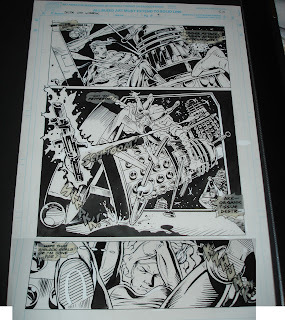 Panel Borders: Gosh! It’s Electric Man! Think the dinosaurs became extinct after an asteroid hit Earth 65 million years ago? You couldn’t be more wrong. Saddle up, check your six-shooters and prepare for life in the Cretaceous as Flesh: The Dino Files collects together 35 years of one of the most popular series in the history of legendary comic book 2000 AD. By the 23rd Century, man has drained the planet’s resources bare, but thanks to time-travel technology Trans-Time Corporation sends rangers back to the days when dinosaurs ruled the Earth. These latter day cowboys round up vast herds of giant reptiles – all destined for the plates of a hungry future! But no creature fancies being served up as steaks, and packs of ferocious dinosaurs soon put a halt to Trans-Time– with everything from terrifying T-Rexs to chilling cybosaurs in all-out dino action! 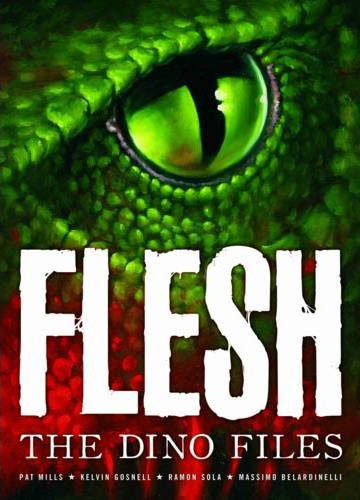 For the first time, Flesh: The Dino Files collects the original Flesh story, which started in the very first issue of 2000 AD in 1977, and its recent sequel, Texas. This brand new collection features stunning black and white artwork from industry legends such as Boix, Ramon Sola and the late Massimo Belardinelli with newcomer James McKay. Are falling sales bad news for The Dandy? (With thanks to Ian Wheeler and Jeremy Briggs): The ABC sales figures are out for the first half of 2011 and DC Thomson's Dandy - revamped in October 2010 and promoted with a massive initial print run - is not looking at all healthy. It is not even making a 7,500 issue average compared to over 15,000 in the previous period (view the report here). The detailed figures it indicate Britain's oldest humour comic doesn't even sell an average of 6,900 copies in shops in the UK and Eire combined, suggesting the revamp has failed to capture new readers. Here are the overall figures for various British comics, and we have updated our longer list here on the main DTT site. Note that titles such as 2000 AD, Judge Dredd Megazine and Commando are not listed (although based on recent interviews it's estimated Commando sells some 8000 copies per issue) and some publishers such as Titan Magazines ABC list very few titles, so this should not be seen as a full snapshot of the British comics industry. Strong figures for some other titles - although other humour titles such as Simpsons Comics and SpongeBob Squarepants have also seen sales falls - make the Dandy's dropping sales even more shocking, but would DC Thomson consider cancelling such a 'heritage' title, particularly given its strong brand name outside of comics? We have to wonder, though, whether DC Thomson management might again be considering merging the title with its stronger partner in the stables - The Beano. 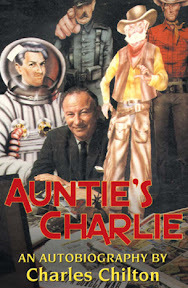 Fantom Films has just published Auntie's Charlie, the autobiography of BBC radio presenter, writer and producer Charles Chilton, creator and writer of Eagle's successful Riders of the Range strip as well as the classic science fiction radio series Journey into Space. Described by the Sunday Telegraph as ‘the one genius the BBC ever had on its staff’, Charles Chilton MBE joined the Corporation at 15 as a messenger boy and went on to carve out a 46-year career as a presenter, writer and producer. Auntie’s Charlie discusses his life from growing up on the streets of 1920s St Pancras, via early years at the BBC working for the Gramophone Library, to writing the infamous production Oh What a Lovely War for Joan Littlewood’s Theatre Workshop. While with the BBC Charles was sent to the United States to research, write and produce a number of series based on American western history. One of these, Riders of the Range, lasted for five years until 1953 and also spawned the Eagle comic strip. (Chilton also wrote another western series, "Flying Cloud", for the Eagle's sister comic, Girl). However, major international recognition came with his science fiction trilogy Journey into Space which he wrote and produced between 1953 and 1958. The spin-off strip, published in the Junior Express and drawn by Italian artist Ferdinando Tacconi, currently features in Spaceship Away magazine. Charles Chilton’s tells his own story in his own words – an autobiography that is frank, vivid, wry and engaging. Published in limited collectors edition of just 200 copies, each hardback book will be individually numbered, feature an exclusive cover, and signed by Charles. Fantom Films have also re-published the original Journey into Space novels as limited edition hardback books, and are the publishers of Doctor Who producer Barry Letts memoir Who & Me and numerous books by and about Doctor Who companion actress Deborah Watling. 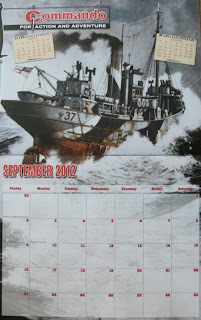 I've got into something of a routine with Commando calendars enjoying using one for a year and then not having one available to me the next year. The first one(s) came out in 2006 for use in 2007. Bizarrely there were two issued that year, one high quality one, The Art Of Commando published by DC Thomson from the original artwork and the Commando Covers Of Yesteryear which reproduced the covers of 12 issues taken from the not always immaculate issues themselves. This second one was published by Spitfire Designs and, although still formally licensed from DCT, was only sold through bargain book shops. 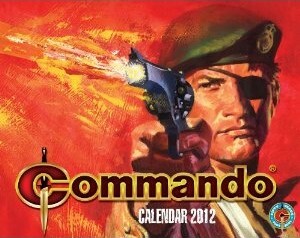 Two years later Unique Comic Collectibles produced a second Art Of Commando calendar for 2009 as well as a Starblazer calendar for that year, both fully licensed and with images from the artwork as well. 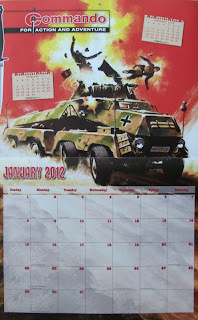 However Unique went out of business and so while DCT last year gave us the usual Broons and Oor Wullie calendars, along with the nicely designed but ultimately disappointing Retro Beano calendar, there was no Commando to be seen. This year however Waverley Books, publishers of the History Of Beano and the various Broons cookbooks have come to our rescue with their simply titled Commando Calendar 2012. While Waverley are part of the greater DC Thomson empire they maintain both their independence and a commitment to top quality product and the Commando calendar is no exception. Priced at £6 rather than the usual calendar price of £10, the buyer gets 13 full colour Commando covers printed from the original artwork, January to December plus the front cover, although interestingly of the three images on the back cover, which are there to help to sell the sealed calendar to prospective buyers, only one appears inside, a Jeff Bevan illustration of a British warship. The calendar itself is approximately A4, so turning into approximately A3 when hung on the wall, with the dates on the bottom half of each page in clear boxes with copious holidays mentioned. Even the opening and closing ceremonies of the London Olympics are included. The artwork takes up slightly more than the top half of each month with the Commando logo and dagger superimposed on each one. As befits his place amongst Commando cover artists, six of the twelve months feature Ian Kennedy covers while the others are a mixture of other artists. Annoyingly there are no artist credits or issue numbers included on each month and while this information will no doubt eventually come out on the various Commando fansites it would have been nice to see it here since previous editions of the calendar included it. Rather more annoying is that the preceding and following months dates are added as "ripped off" calendar pages stuck over the main image as if the designer considered them important when they really should have been placed less obtrusively out of the way near the date boxes. But that is really my only complaint for a calendar that maintains the quality of the Art Of Commando calendars of previous years. High quality, nicely designed (on the whole) and at a surprisingly cheap price, the Commando Calendar 2012 deserves its place on your wall for the coming year. The Commando Calendar 2012 is available at both the DC Thomson Shop on-line as well as their new bricks and mortar shop in the Courier Building, 2 Albert Square, Dundee. (Updated 27/8/11): The popular Crikey! fanzine (which takes a nostalgic look at classic British comics) may no longer be available as a print publication but the editors have just released a new special (comprising over 100 pages) which is available to buy on disc at the Crikey! website and via download on yudu.com. Whilst purists might bemoan the demise of the old magazine format, it's a sign of the times that the Crikey! team have gone down this route and printed or not, the new special is absolutely crammed with material and is arguably Crikey! 's strongest offering yet. Articles include a look at the Eagle photo-stories of the 1980s, an overview of the often-overlooked DC Thomsom comic Sparky, the Marvel UK Action Force comic, Death's Head remembered, the short lived IPC publication Supernaturals, the British Invasion of DC Comics, a Planet of the Apes mystery from the 1970s, a Bryan and Mary Talbot interview, a look back at Whoopee! and, as they say, much much more. The Crikey! editors Glenn Fleming and Tony Ingram deserve credit for soldiering on in difficult financial times so please give them your support! 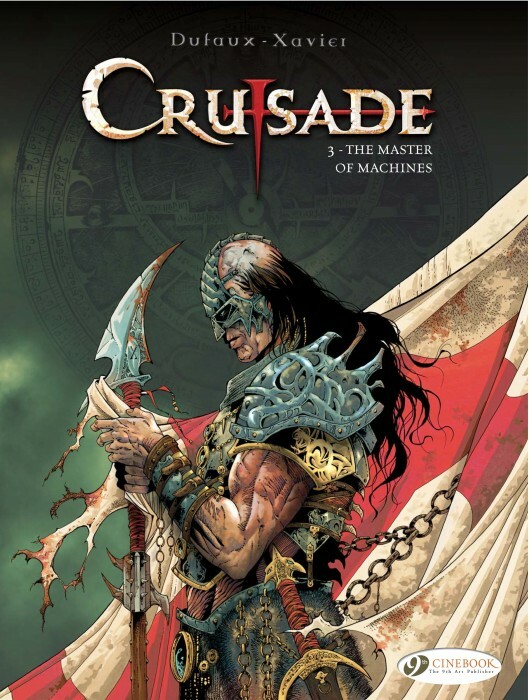 The Crusade that is missing from history continues with its third book The Master Of Machines as writer Jean Dufaux and artist Philippe Xavier continue their complex tale of religion, demons and the quest for control of the Holy Land. Gauthier of Flanders, in an attempt to ally himself with a Jewish sect, is underground battling a demon known as the Aa while his love, Syria of Arcos, has been saved from the grossly deformed bandit chief Sarek Pasha by Sultan Abdul Razim and taken as his "guest" to Jerusalem. 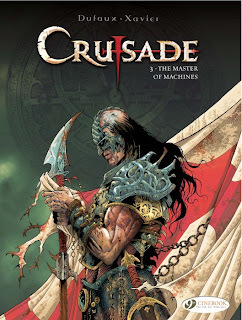 Meanwhile in the Christian camp the mercenary army leader know as the Master Of Machines who was summoned there by Elenore of Arcos, Robert Duke of Taranto's lover and Gauthier's wife, challenges Robert for control of the Crusader army. 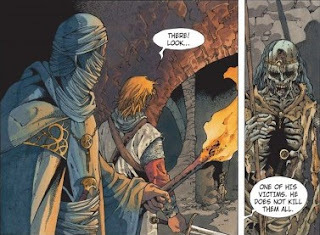 Crusade remains in almost equal parts excellent and frustrating. Excellent due to Xavier's lovely artwork and page layouts as well as the complexity of Dufaux's plotting and yet frustrating also for the complexity of the plotting which has three main story strands running at almost full speed at the same time. This book focuses more on Gauthier's battle with the Aa and the Master Of Machines challenge to Robert's command than Syria's plight and yet it places her right where, presumably, a major battle is about to take place. Xavier's internal artwork continues to remind me of John Bolton's especially his work on The Black Dragon, written by Chris Claremont, which like Crusade mixed Crusader knights with the supernatural, while his cover showing the Master Of Machines remains as striking as the rest of the series. Dufaux's plotting, I suspect, is only frustrating due to not having the whole story available to us and Dufaux having to get so many different characters into place before the final confrontation in the fourth book, The Fire Beaks, named for an area south of Jerusalem where the Master Of Machines considers the true riches of the Holy Land lie. The Master Of Machines continues Crusade's lovely artwork and complex, if perplexing, plot. With the fourth book due on February 2012 I hope, and fully expect, to be able to say that it was all worth it and that the series deserves a reread from the beginning.